Dendrites form the major receiving part of neurons. It is within these highly complex, branching structures that the real work of the nervous system takes place. The dendrites of neurons receive thousands of synaptic inputs from other neurons. However, dendrites do more than simply collect and funnel these signals to the soma and axon; they shape and integrate the inputs in complex ways. Despite being discovered over a century ago, dendrites received little research attention until the early 1950s. Over the past decade there has been a dramatic explosion of interest in the function of these beautiful structures. Recent new research has developed our understanding of the properties of dendrites, and their role in neuronal function. 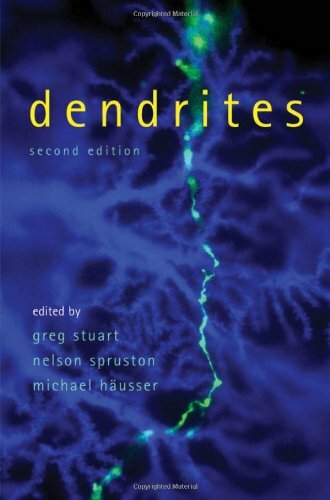 The first edition of Dendrites (published by Oxford University Press in 1999) was a landmark in the literature, and helped to stimulate the rapid growth of the field of dendrite research. The second edition was published in 2007. This new edition features complete revisions of the previous chapters to reflect recent advances, and also includes 4 new chapters. It thus gathers the new information on dendrites into a single volume, with contributions written by leading researchers in the field, and presents a survey of the current state of our knowledge of dendrites, from their morphology and development through to their electrical, chemical, and computational properties. As such it will not only be of interest to researchers and graduate-level students in neuroscience, but will also be useful to researchers in computer science and IT, biophysics, physiology, and psychology. 40% new material, with the other 60% thoroughly revised.